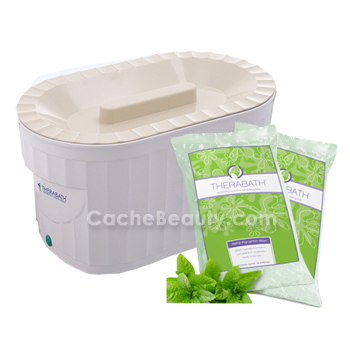 THE THERABATH PROFESSIONAL THERMOTHERAPY PARAFFIN BATH IS HERE! 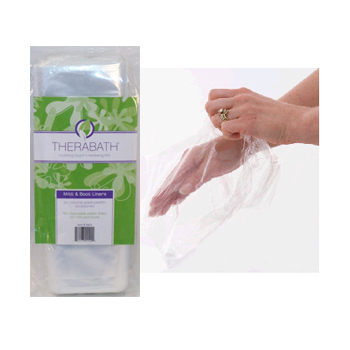 The Therabath continues to be manufactured in the USA, made to FDA Class II Medical Device Standards, and is still the only Made in the USA CE/CETL listed portable paraffin bath on the market. This item can NOT be shipped by air (Overnight, 2nd Day, 3rd Day, Express or Postal) due to the size and weight of the item. 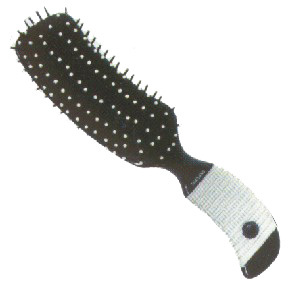 Item will ONLY be shipped to continental United States address via UPS Ground or additional shipping charges will apply. 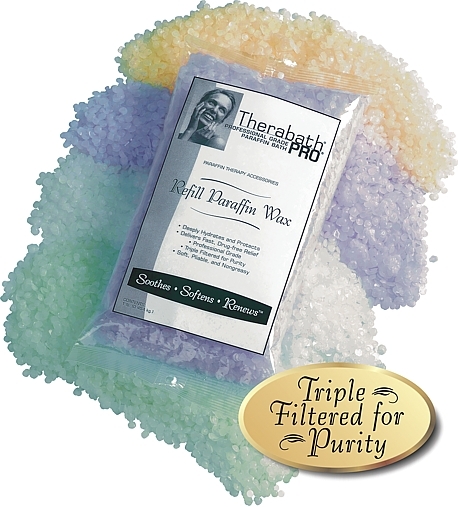 Crystal Clear Quality ~ The Finest Paraffin for Skin and Nails! 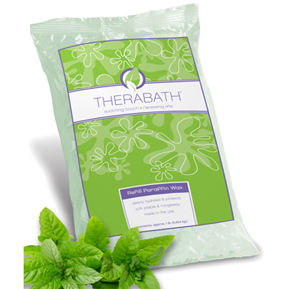 Invigorating, minty and clean. 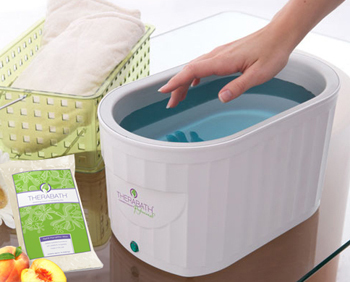 Perfect for pedicures and foot treatments. 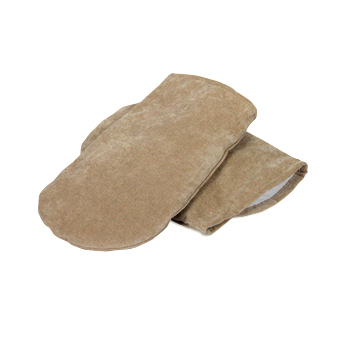 Two Insulated Mitts: Heavyweight ultraplush terry velour, 8oz polyester fiber-fill for maximum comfort and warmth, easy-to-use Velcro® closures, machine washable. 4-oz. 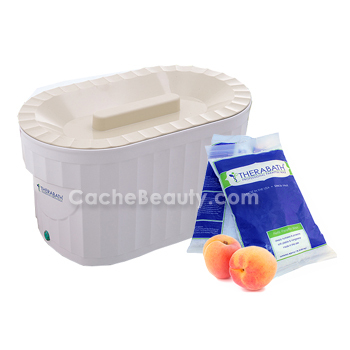 Sanitizing Spray: Cleanses skin prior to paraffin application. 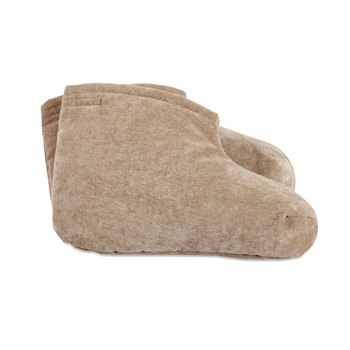 Two Insulated Boots: Heavyweight ultraplush terry velour, ThinsulateT-lined for maximum comfort and warmth, easy-to-use Velcro® closures, machine washable. ALL NEW! 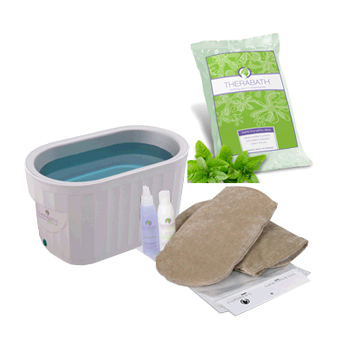 Make paraffin facials easy for softer, more radiant skin with a Facial Treatment Paraffin Accessory Kit. 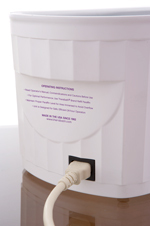 * Porceiain Paraffin Bowl: Features easy-grip handle; heavy porcelain insulates to keep paraffin liquid longer. 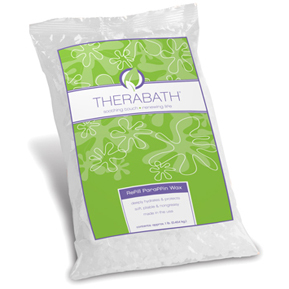 * Ceramic Paraffin Ladle: Easily scoop paraffin from your Therabath unit to your paraffin bowl. Simple to clean. 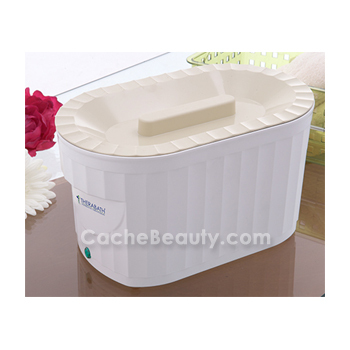 * 100 Paraffin Facial Strips: Dip strips and place on face - easier to use and more customizable than gauze masks! * Made in the U.S.A! 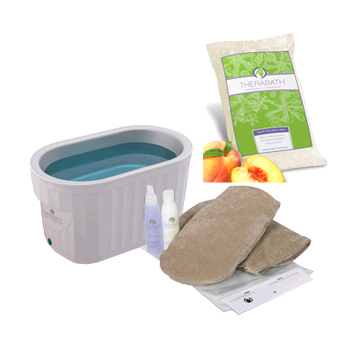 Use these insulated boots along with disposable plastic liners to retain the warmth from paraffin treatments, prolonging the heat benefit for increased pain and stiffness relief and softer, smoother skin. 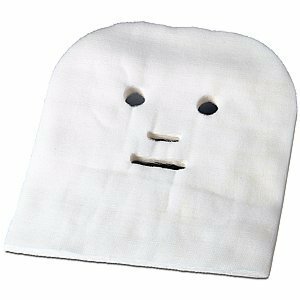 Use these gauze facial masks during paraffin facials along with a paraffin application brush to enhance the moisturizing effects for softer, healthier looking skin. 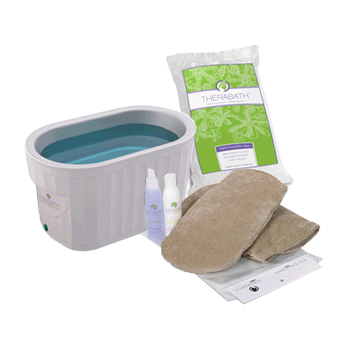 Leaves skin more radiant and smooth. Use this hydrating cream prior to paraffin application and in-between treatments for daily maintenance. 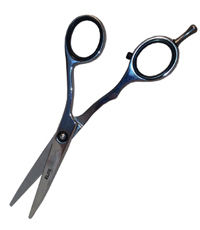 For extremely dry skin and cracked cuticles, apply after paraffin treatment as well. Now available in 2 NEW scents and our traditional ScentFree! 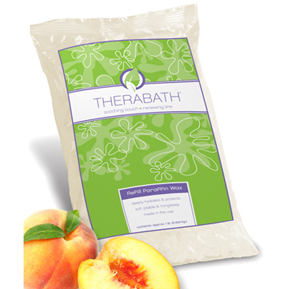 This refreshing antiseptic formula cleanses skin and nail area prior to paraffin application. 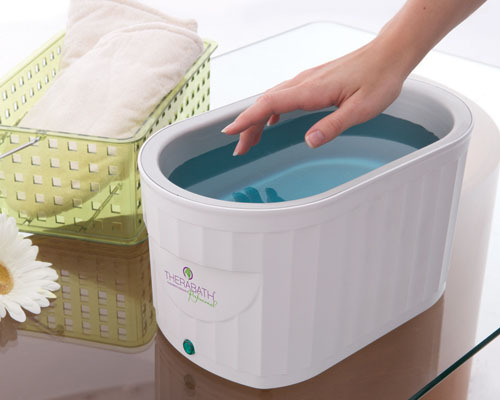 The perfect beginning to a luxurious paraffin manicure or pedicure! 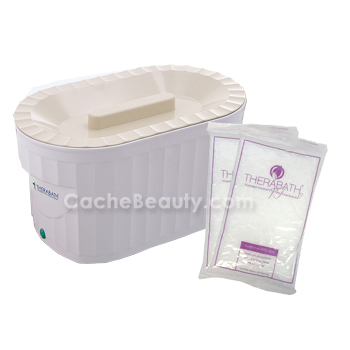 All Therabath II text and graphics copyright 2004 by WR Medical Electronics Co.